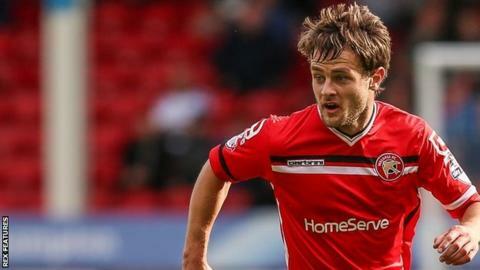 Walsall scored two goals in four minutes to defeat Doncaster and climb back into second place in League One. Rovers defender Aaron Taylor-Sinclair hit the top of the bar while Paul Downing headed against the woodwork for the Saddlers, both coming from corners. Sam Manton beat two challenges to slam in Walsall's opener before Andy Taylor doubled the lead with a deflected shot. An excellent curling effort from substitute Liam Mandeville gave Rovers hope but the visitors held firm. On his return to Doncaster, the three points for Walsall boss Sean O'Driscoll takes his side to within a point of leaders Burton Albion. "We got anxious in the first half and I said to them 'I know you want to get the three points but don't get too anxious with things, it'll come'. "So half-time was really good for us. We wanted to make their back four defend a little bit more. "Second half we did that and we were quite comfortable. Even at 0-0 I thought we were quite comfortable. To go 2-0 up was great." Match ends, Doncaster Rovers 1, Walsall 2. Second Half ends, Doncaster Rovers 1, Walsall 2. Attempt missed. Mitchell Lund (Doncaster Rovers) header from the centre of the box is close, but misses to the left. Attempt saved. Liam Mandeville (Doncaster Rovers) right footed shot from outside the box is saved in the bottom left corner. Cameron Stewart (Doncaster Rovers) wins a free kick in the attacking half. Substitution, Doncaster Rovers. Mitchell Lund replaces Craig Alcock. Goal! Doncaster Rovers 1, Walsall 2. Liam Mandeville (Doncaster Rovers) right footed shot from outside the box to the bottom right corner. Substitution, Walsall. Rico Henry replaces Milan Lalkovic. Attempt missed. Lynden Gooch (Doncaster Rovers) left footed shot from outside the box is too high. Substitution, Doncaster Rovers. Cameron Stewart replaces Richard Chaplow. Substitution, Doncaster Rovers. Liam Mandeville replaces James Coppinger. Goal! Doncaster Rovers 0, Walsall 2. Andy Taylor (Walsall) right footed shot from the centre of the box to the bottom right corner. Assisted by Romaine Sawyers. Corner, Walsall. Conceded by Luke McCullough. Attempt blocked. Lynden Gooch (Doncaster Rovers) right footed shot from outside the box is blocked. Goal! Doncaster Rovers 0, Walsall 1. Sam Mantom (Walsall) left footed shot from outside the box to the bottom right corner. Attempt saved. Tom Bradshaw (Walsall) right footed shot from the centre of the box is saved in the top centre of the goal. Anthony Forde (Walsall) hits the bar with a header from the right side of the six yard box. Corner, Walsall. Conceded by Craig Alcock. Second Half begins Doncaster Rovers 0, Walsall 0. First Half ends, Doncaster Rovers 0, Walsall 0.